We all know the negative connotation that can be associated with the word. But what if we turned that word into your best friend, and showed you how to use it to your benefit to get RESULTS on your wellness journey? What if, when you don't have something planned or life throws you a curve, you had a back up plan that you didn't even need to think about, you could just do! Chances are you have default actions in your day to day life already. You have dinners that you constantly fall back on when you forget that there is a school concert that night - and if you're like most people it's a box of mac and cheese or a plate of spaghetti and red sauce. Why? Because it's easy. It's already sitting in your pantry and you don't need to read the instructions. It is comfortable, and you can go box to table in 11 minutes flat! This is what your health journey needs. Both for dinner & for movement. So today I want to share with you some of my all time favorite defaults. I have gone days, weeks, months where this is literally all I ate and all I did for a workout so I could stay on track. Is it perfect - absolutely not. But it is better than the alternative- which for me is take out and a nap! Here's a little fun fact about me... I HATE TO COOK. I don't mind planning, I don't mind shopping, I don't even mind prepping..... but that's about as far as I willingly go in the kitchen. Before my husband, I lived on baked potatoes and cereal. My number one dinner default is: pita pizza. 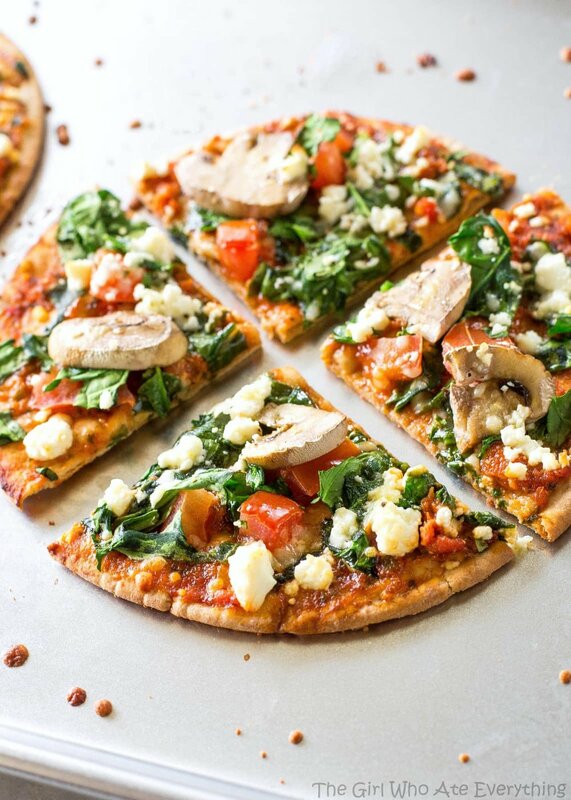 I take a whole wheat pizza (or other crust source depending on what we have in the house at that moment), drizzle it with olive oil, leave a dash of garlic and top it with feta and whatever fresh veggies we have and bake for 20 minutes. If I have some shredded chicken I'll toss some of that on too! Shredded chicken leads us into my second kitchen default.... buying a weekly rotisserie chicken to shred and leave in a tupperware bowl. This gives me instant protein that I only have to microwave for a minute to heat it up. I can pile it on a slice of bread with some bbq and a little cheese and toss it under the broiler for an open pulled chicken sandwich. I can toss it on a salad, pick on it plain, or even top some tortilla chips with it! BONUS: I can toss it on the highchair and the babes will go crazy for it - no work on my part! My third default is a "dunker" egg sandwich. Honestly- I dont even know what this type of egg is really called because we grew up calling them dunkers. You know the kind that you could dunk your toast in! I fry one up on the stove and toss it on a piece of toast! This is a great dinner when I'm getting home after the kids are already in bed! Again nothing to think about and I have everything I need. That is the point of the default. The key though - is that to make it a good default not only does it have to be a smarter choice than the "other option" but you MUST ENJOY IT! If you don't enjoy your default I can guarantee that you won't default to it! Honestly - I can't tell you how many times I have just set a timer for 10 minutes- then went up and down the stairs as many times as possible for that 10 minutes. Another Idea is to pick a movement for the top of the stairs and a movement for the bottom: Example 10 squats at the top and 10 pushups at the bottom.... pick a number of sets or set the timer and go. I also just grab a weight and go up and down. I may change where I hold the weight with each round - or I may not. It's full body and I don't need to think about it. Lastly - I often revert to windmills and single leg squats. Sometimes I'll pick up a heavy weight so that I can decrease my reps and still feel good! Hope this serves as a little inspiration to you. Defaults by nature will be the thing you keep doing when you don't feel like it - to some degree we don't pick it, it's what we LIKE to do.... but we do sometimes have to tailor and force it until it BECOMES a habit! Remember a good default will keep you moving forward at a time when you could potentially start slipping backwards.